I was looking at the diagram of the fuse block of a 1961 in the '61 service manual. At the bottom right of the 1962 fuse block, there are 2 openings, but the factory didn't put the electrical connections into them. In the 1961 book, it shows this as the place to hook up the spotlights. Is it possible to add these to the 1962 fuse block? If so, where would I get the terminals, and how would I complete the wiring? I was thinking that I could use the accessory terminal, but I already have plans for that terminal. Ask Don Bock at American Autowire. I got connections from him/them for a connector that came loose on a new harness. Auto Zone has the connectors you need. Today, I checked each terminal on the right for power, and learned that the ACC. terminal is dead. Checked all the fuses, and they are all good. Does anyone know where this terminal gets its power from? 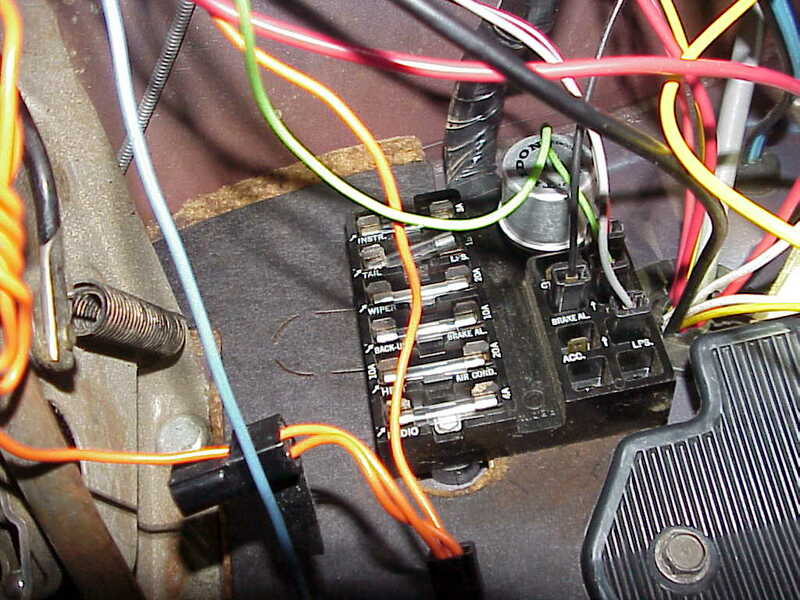 I was thinking that it might be fused, but can't find any other fuses, except for the air conditioner under the hood, and that one is disconnected until I finish putting the A/C back on the engine. The ACC terminal and the LPS terminal next to it are both powered by a 20 gauge gray wire that is part of the instrument lamps circuit. That circuit receives its power from a 16 gauge dark green wire off of the headlight switch. All these circuits are protected by the top left instr.fuse. What do the letters "LPS" mean. I believe they use the standard Packard 56 male terminal. Link to terminal. I think I can fix you up from my old fuse block. I think I can safely remove the bus bar terminal for ACC/LPS. Send me a PM with your address. It may take me a day or two to get it in the mail.